Tips and tricks to give your app the greatest chance of success once it's live. Hey there and welcome back! In this series, you’ve learned quite a bit. You’ve learned about BuildFire, what the control panel is, the difference between marketplace features and core features, some common components you’ll run into, and how to publish your app. So by now, you’ve got this awesome app built and published. Now is the time to ask yourself, “What next?” In this lesson, I’ll give you some insight on how to give your app the greatest chance for success. Associating your app with your identity is not limited to just online collateral. You can promote your app in almost any marketing material you put out. This could be anything from traditional print advertisements to catalogs or brochures, and even your email signature. To help you out we’ve created a collection of some marketing materials that you can use for your app which can be accessed here. While it is true that social media can bring in great results, there’s a number of variables that influence how successful your promotional attempts are which means that not all businesses will reap the same benefits. The fact of the matter is, the average half-life of a tweet is only 24 minutes (versus 90 minutes for a Facebook post), and Facebook posts that aren’t boosted only reach between one to two percent of your audience which means that it’s important to not rely exclusively on social media to boost the visibility of your app. The law of reciprocity is a powerful one. It’s one of the reasons why giving out samples of something work so well when selling a product. When you give someone something, they feel as though they need to reciprocate. So, instead of putting up a message that simply says, “Download our App,” explain to your potential users the benefits of why they should download your app and consider giving them a special incentive if they do so. This can take many forms, one way would be creating a contest or giveaway for your users to incentivize them to download your app and stay engaged. For example, you could run a giveaway throughout the month of June and the way users would enter is to download your app and create an in-app account. Then once the month is over you’ll pick one lucky winner to win your super awesome prize. This not only grows your user count, but also gives you more opportunities to reach out to your users and keep them engaged. Once someone has downloaded your app, you can now reach out to them through push notifications and have now acquired prime space to engage with them right on the very device they have at all times. Any marketing you employ in promoting your app shouldn’t be limited to what you put out immediately following your app’s launch. Once your app is live you should maintain a consistent level of promotion. Did you recently add new content to your app? Write about it periodically on your blog, mention new features in YouTube or Vimeo videos. Ensure that your app’s store badges are prominently displayed on your website. Mention it every few weeks on your social media accounts. It’s best to have your app mentioned on a regular basis so that it’s never far from your user’s minds. 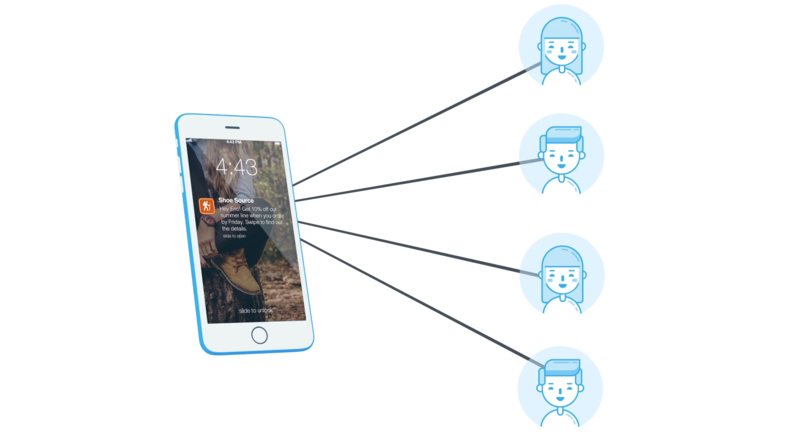 Push Notifications are a great way to communicate instantly to your user base. With our selective Push Notifications, you’ll be able to send your message to the right users at the right time by creating groups (or channels) to which the users can subscribe, selecting a single user, or targeting multiple users based on custom parameters. You can even schedule notifications so that you can set it and forget it. To help you leverage the power of Push Notifications, we’ve put together a dedicated article about how to create engaging push notifications here as well as a dedicated push notification tutorial which you can access here. There are several marketplace features that can personalize your user’s experience within your app. Because they require the user to login to use it, you’ll have a better chance of them giving you important information that you can then use to market to them. The Social Wall feature is an amazing way to keep your users engaged and allow them to communicate regularly with each other. This feature is like a mix between chatroom and a message board. Users can use this feature to create discussions, comment on existing ones, and even share images with one another. A user can choose to follow a social wall and when they do so, will receive push notifications whenever other users post to the wall, or when they comment on or like a post that the user has made in that wall. The Loyalty feature is a great feature that allows your users to accumulate points over time and then redeem these points for specials and incentives that you offer. This not only encourages repeat visits to your business, but encourages users to spend more money to rack up those sweet loyalty points faster! Unlike other “punch card” systems, our Loyalty Plugin works for any type of business because it allows you to set the promotions you want to offer as well as dictate how many points users get per dollar spent. Coupons are a great way to encourage consumers to spend money and help spur on repeat visits, and our Coupon feature can help you do this in your app! Whether you have one location or multiple locations, the Coupon feature allows you to set up coupons that are mappable, filterable, and searchable for your customers. When you combine these strategies, you’ll not only create initial downloads, but also ongoing engagement. In this series, we’ve covered everything from how to build your app, to how to publish your app, to some methods to keep your users engaged. If you have any questions, feel free to reach out to us at support@buildfire.com and we’d be happy to help!